If the pneumothorax is small and without symptoms, pneumothorax treatment is conservative, and generally involves serial chest x-rays to ensure that the air pocket is not getting larger. If the pneumothorax increases in size, or is large to begin with, treatment involves putting a small tube into the chest cavity to drain the air, allowing the lung to re-expand. The tube is kept in place until the lung has time to heal and the collection of air has resolved. The size of the pneumothorax, in addition to symptoms, other injuries, and the need for other surgical procedures which would necessitate general anaesthesia all effect the pneumothorax treatment. A Pneumothorax (pl. pneumothoraces) is a collection of free air in the chest outside the lung i.e in the pleural space that separates the lung from the chest wall. This is commonly referred to as a “Lung Collapse”. In the setting of trauma (punctured lung), the source of the air is a damaged area of the lung which leaks air into the chest cavity. The air builds up and “collapses” the lung. The overwhelming majority of the time, the lung is damaged by a broken rib or “popped” like a balloon squeezed too hard. Pneumothorax, or a collapsed lung, is the result of a change in pressure around the pleural cavity which prevents the diaphragm from opening the lung, making breathing more difficult. Pneumothorax treatment include a simple operation, called aspiration, which reduces air pressure and releases any trapped air in the pleural cavity. A primary pneumothorax is one that occurs without an apparent cause and in the absence of significant lung disease, while a secondary pneumothorax occurs in the presence of pre-existing lung pathology. If an open chest wound is sufficiently large, intrapleural pressure will remain equal to atmospheric pressure and, with each breath, air will be sucked in and out of the chest wall, resulting in marked paroxysmal shifting of the mediastinum with each respiratory effort. The subsequent hypoventilation and decreased cardiac output can be life threatening. In the emergency situation pneumothorax treatment include closure of the wound by any means should be attempted, followed by surgical closure and insertion of an intercostal drain. Injury to the lung results in a continuing air leak which acts as a one-way valve, allowing air to progressively accumulate in the pleural space. This creates positive intrathoracic pressure leading to mediastinal shift and compression of the remaining lung. These increasing pressures if not corrected, can invert the diaphragm, cause subcutaneous emphysema and ultimately a cardiorespiratory arrest. Signs and symptoms of Tension Pneumothorax include surgical emphysema, absent breath sounds on the affected side, mediastinal shift and tracheal deviation to the opposite side and acute respiratory distress. When an intercostal drain is inserted into the pleural space, the air is released under pressure. This occurs with partial collapse of the lung away from the chest wall but is not 'under tension'. However, the pneumothorax may increase in size at any time and has the potential to develop into a tension pneumothorax. There are numerous causes of a pneumothorax, but the commonest include penetrating injuries causing punctured lung (e.g. stab wound, placement of a subclavian line) and breeches of the visceral pleura (e.g. spontaneous rupture of a subpleural bulla or mechanical ventilation with high pressures). Symptoms of a pneumothorax include chest pain that usually has a sudden onset. The pain is sharp and may lead to feelings of tightness in the chest. Severe central chest discomfort, with or without pleuritic component, severity depends on extent of mediastinal shift. Shortness of breath, rapid heart rate, rapid breathing, cough, and fatigue are other symptoms of pneumothorax. The skin may develop a bluish colour (termed cyanosis) due to decreases in blood oxygen levels. Examination of the chest with a stethoscope reveals decreased or absent breath sounds over the affected lung. When air is introduced into the pleural space, the resulting pneumothorax can be recognized radiographically. 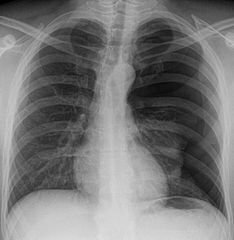 The cardinal radiographic sign is the visceral pleural edge: lateral to this edge no vascular shadows are visible and medial to this the collapsed lung is of higher density than the contralateral lung. It is important to remember that in the supine position, the air of a small pneumothorax will collect anteriorly in the pleural space; thus on a portable supine chest radiograph, the pneumothorax will be visible as an area of relative translucency without a visceral pleural edge necessarily being identifiable. If air enters the pleural space during inspiration but cannot leave on expiration (usually because of a check-valve effect of the torn flap of the visceral pleura), pressure increases rapidly and this results in a life-threatening tension pneumothorax. This can be recognized by a shift of the mediastinum to the opposite side and straightening of the ipsilateral diaphragm. Increased resonance is heard when the chest wall is free to vibrate over an air-filled space, such as a pneumothorax or bulla. For small pneumothoraxes in an asymptomatic patient, medical management usually involves observation and/ or aspiration. A large pneumothorax treatment requires intercostal drainage. Intravenous antibiotics should be commenced at the same time to prevent infection and resultant sputum retention, which may delay re-expansion of the collapsed lung. A recurrent pneumothorax requires more aggressive management, and hence a partial pleurectomy may be performed if the patient is fit to undergo surgery. If the patient is too unwell to undergo surgery, a talc pleurodesis is recommended as pneumothorax treatment. Pleurodesis can make transplantation more difficult as it takes longer to remove the lungs and hence is not routinely performed. The World Health Organisation guidelines state pleurodesis virtually rules out any prospect of future lung transplantation, however the current consensus is that pleurodesis is not an absolute contraindication. There are no published data regarding physiotherapy management of patients with pneumothorax. The following recommendations are based on expert opinion and clinician consensus. A small pneumothorax (< 3 cm apex-to-cupola distance)is not a contraindication to chest physiotherapy, but if during treatment the patient becomes more breathless or complains of chest pain the doctor should be notified immediately as it is possible that the pneumothorax could have increased in size. If the patient has had a recent pneumothorax or a history of recurrent pneumothoraxes IPPB is probably contraindicated. Gentle coughing can be performed and adequate humidification for ease of sputum expectoration. Reduce exercise intensity and avoid upper limb resistance exercises. When exercising a patient who has a small pneumothorax, or following a recent pneumothorax or haemoptysis, the physiotherapist should monitor the signs and symptoms during an exercise session. A larger pneumothorax (> 3 cm apex-to-cupola distance) will require an intercostal drain and physiotherapy should be withheld until the drain has been inserted. Analgesia will probably be required before treatment and the patient's usual physiotherapy regimen should be continued, but chest clapping may be unnecessary and may cause discomfort. If the air leak persists and surgical intervention is undertaken, it is essential that physiotherapy is restarted as soon as the patient is awake postoperatively. Adequate analgesia and humidification will assist the clearance of secretions. Shoulder ROM exercises can be performed but avoid upper limb resistance exercises. Aerobic exercise should be started like walking, gentle cycling etc. Avoid positive pressure therapy while draining and for 1-2 weeks after to avoid pleural fistula and risk of recurrence.